Spend the 6th (Mon) exploring nature at Yellowstone National Park. 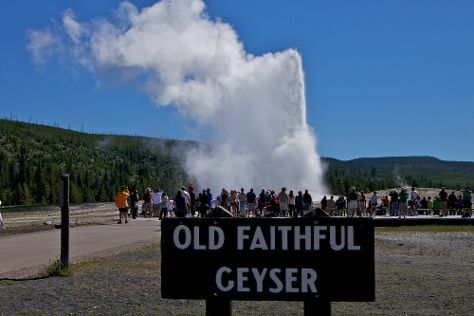 There's more to do: take in the natural beauty of Old Faithful and contemplate the waterfront views at Yellowstone Lake. For more things to do, reviews, ratings, and tourist information, use the Yellowstone National Park trip planner. Evansville to Yellowstone National Park is an approximately 7.5-hour combination of flight and car. You can also drive; or do a combination of bus, shuttle, and car. The time zone difference moving from Central Standard Time (CST) to Mountain Standard Time (MST) is minus 1 hour. In May, Yellowstone National Park is much colder than Evansville - with highs of 53°F and lows of 27°F. Finish your sightseeing early on the 7th (Tue) so you can travel to Colorado Springs. On the 7th (Tue), tour the pleasant surroundings at Garden of the Gods. To see traveler tips, maps, more things to do, and tourist information, you can read our Colorado Springs road trip planner . Getting from Yellowstone National Park to Colorado Springs by combination of car and flight takes about 5.5 hours. Other options: do a combination of car, flight, and shuttle; or drive. Plan for a bit warmer temperatures traveling from Yellowstone National Park in May, with highs in Colorado Springs at 68°F and lows at 42°F. Finish your sightseeing early on the 8th (Wed) to allow enough time to drive to Canon City. Your day-by-day itinerary now includes Royal Gorge Bridge and Park. On the 8th (Wed), get a new perspective on things with Boat Tours & Water Sports and then take a memorable ride with Royal Gorge Bridge and Park. Get ready for a full day of sightseeing on the next day: hike along Tunnel Drive and then take a memorable drive along Skyline Drive. Plan a Canon City trip in moments using our itinerary builder. You can drive from Colorado Springs to Canon City in 1.5 hours. In May in Canon City, expect temperatures between 72°F during the day and 46°F at night. Finish your sightseeing early on the 9th (Thu) so you can drive to Grand Canyon National Park. On the 11th (Sat), hike the day away at Bright Angel Trail. The adventure continues: explore the stunning scenery at Grand Canyon South Rim, hike along South Kaibab Trail, and take some stellar pictures from Mather Point. To see where to stay, ratings, more things to do, and other tourist information, refer to the Grand Canyon National Park visit planner. Drive from Canon City to Grand Canyon National Park in 10.5 hours. Traveling from Canon City in May, Grand Canyon National Park is a bit cooler at night with lows of 33°F. Wrap up your sightseeing by early afternoon on the 12th (Sun) to allow time for the car ride back home.